Only 4 percent of working people in Russia believe they have enough savings to live on in their golden years, and more than half of them admit that they have no idea how to save for retirement. According to polls by consulting company Accenture, only 4 percent of Russians believe they have enough savings to allow them to retire comfortably. In contrast, 39 percent of Indians and 28 percent of Chinese believe they will have enough to live on in their golden years. In the United States and Germany, between 19-21 percent of people say they have enough savings for retirement. Ninety-two percent of Russians said they were worried about how they would live after retirement – more than citizens of any other country except South Korea and Mexico. Roughly one-third of those polled in developed countries said they were saving for retirement. In contrast, only 12 percent of Russians said they were preparing for their post-working life. Fifty-five percent of Russians say they lack the necessary information on how to save for retirement, while an even bigger percentage said they simply had no money to spare for retirement. “In the current economic conditions, people are increasingly worried about their financial future,” said Mark Halverson, managing director of Accenture. “While they are ready to put some money away, they frequently lack information on the saving options that are out there, and are financially restrained.” In Halverson’s words, the poll also revealed that there is an unsatisfied demand for retirement planning services. 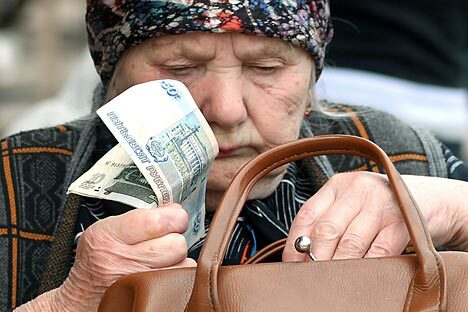 Experts have also cited state policy as a factor affecting the confidence of Russians in their retirement future and their resolve to save up for old age. Specifically, recent statements by public officials concerning the possible abolishment of mandatory funded pension insurance have done little to raise people’s confidence. Chairman of the European Pension Fund Yevgeny Yakushev thinks there are valid reasons for Russians’ fears. “If the regulations are changed but once per decade, it is impossible to speak of any pension savings at all. We have had too many revolutions as it is in the past 20 years, and the comfortable future that is indispensable for long-term financial planning never came. Furthermore, unlike other states with long-established corporate retirement programs, it is an extremely rare case in Russia for someone to receive a high pension allowance in addition to government benefits,” Yakushev said. Vitaly Plotnikov, president of the First National Pension Fund, says that the problem is that the Russian pension system is unpredictable. “It has become a lifestyle. In such conditions, it is difficult to decide whether to start saving for the future,” Yakushev said. Still, he believes the most important reason Russians are in no hurry to put money aside for their retirement is the low income of the majority of the population. This article originally appeared in Russian in RBC Daily.